The Wiborg White Badger has become somewhat of a modern legend. Due in part to the difficulty in obtaining one, but also largely due to Florian's high attention to detail and quality. I personally do not own a Wiborg, but was fortunate enough to be lent a brush by another fine gentleman. I have been using the brush exclusively over the last week and I must admit it is quite remarkable. Is it good enough for me to trade away some of the rarest brushes in my collection? Definitely NOT! Is it good enough that I will continue to seek one out? NO DOUBT! These brushes are all somewhat easily attainable and from memory have displayed similar characteristics to the Wiborg White brush that I have been using. I will be doing a 2-brush shave for the next three days using Art of Shaving Sandalwood cream for the lather. I will face lather with one brush for the first pass, then the other for the second. I will only be taking notes mentally so this definitely isn't an overly scientific test, no need to dilute my opinions with boring facts. Fun review...looking forward to all thoughts. 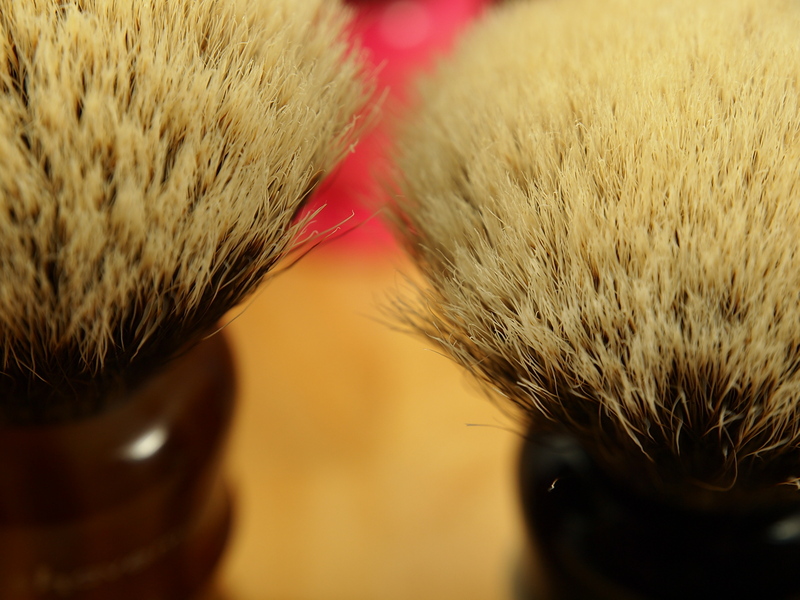 Shavemac makes a very fine brush and is easily recommended by many, myself included, as one of the best values in shaving brushes available on the market. Besides offering great value, the quality is among the best in the world as well. I have owned several Shavemacs over the years and haven't been disappointed with a single one. The 2-band Silvertip in particular has been very pleasant to use. So how does this 2-band Shavemac stand up to the Wiborg? Aesthetically both knots appear to be very well made. The Shavemac has a single stray hair that has bugged me since receiving, but is otherwise perfectly shaped. Both knots feel densely packed when gently squeezed. There is a pronounced glue bump noticeable on the Shavemac which keeps the splay in check and makes the knot appear to be more dense, but in actuality both feel about the same. When lathering the Shavemac actually has slightly softer tips, but feel less natural than those used in the Wiborg knot. While the Shavemac is borderline gel-tipped, with a nice silky texture, the Wiborg feels more like luxurious high thread count cotton. Both feel great on my face but in a different way. The Shavemac also has firmer backbone, due in large part to the pronounced glue bump present. I would consider the Shavemac to be firm and the Wiborg more of a medium to moderately-firm. The Wiborg naturally splayed more and easier due to the lack of the protruding glue bump. In this comparison if I had to choose one brush as the winner it would be the Wiborg. But those are just my preferences and judging by others' reviews and written opinions I would say there are several that would definitely prefer the Shavemac. Good idea. Definitely looking forward to your views. I am a big fan of the Wiborg "White Badger" (owning the below two) and look forward to your comparison. Personally, I rate the "white badger" above the shavemac 2 band silvertip in the "softness" department (rivaling/maybe not reaching the famed Simpson 2 band of 2011-13). I believe the shavemac has a bit more backbone. Both are exceptional knots to own, no doubt. Looking forward to your continued comments. I should probably add a disclaimer that these are my opinions based solely on the brushes that I am comparing and do not reflect an absolute comparison between brands. 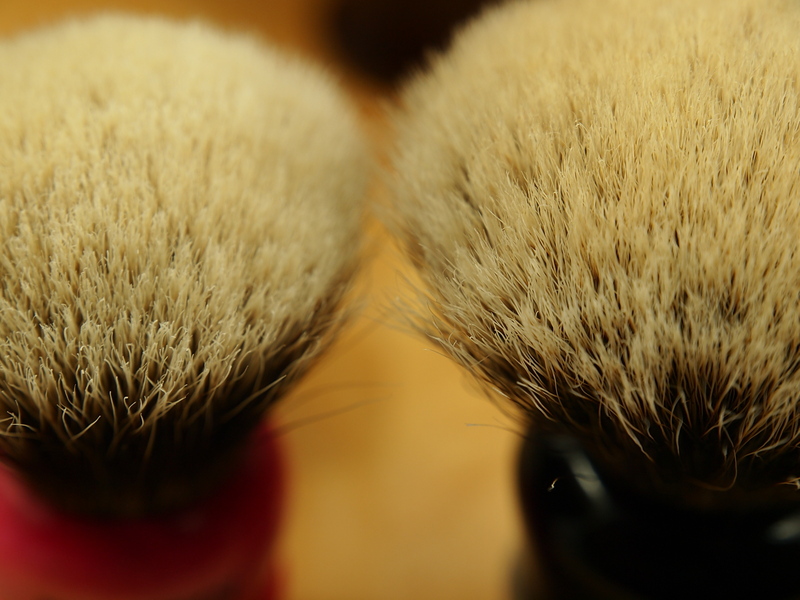 Badger hair is a natural product that is then treated via different methods before being used in shaving brushes. There will be variations in hair thickness and tip softness based on the sorted batch of hair the manufacturers have on hand. I am by no means proclaiming that all Shavemacs are softer than all Wiborgs, my Shavemac does have softer tips than this Wiborg though. (03-17-2017, 08:09 AM)blzrfn Wrote: I should probably add a disclaimer that these are my opinions based solely on the brushes that I am comparing and do not reflect an absolute comparison between brands. Badger hair is a natural product that is then treated via different methods before being used in shaving brushes. There will be variations in hair thickness and tip softness based on the sorted batch of hair the manufacturers have on hand. I am by no means proclaiming that all Shavemacs are softer than all Wiborgs, my Shavemac does have softer tips than this Wiborg though. wow, two of my most favorite brush guru's talking badger on St. Patrick's day. Golly that's cool. Great thread. Looking forward to the rest of the comparisons! I've had several Shavemac 2-band silvertip bulbs and used two of the Wiborg White Badger bulbs, and prefer the feel of the latter. They were winners when it came to face-feel and density. But I've also never been crazy about Wiborg's handle shapes other than The Barber, and don't care for the busy flourish of lettering on the brush at all. Still, a White badger bulb with ebony Barber handle and block script would be welcome here. Looking forward to more reviews. (03-17-2017, 11:11 AM)rsp1202 Wrote: I've had several Shavemac 2-band silvertip bulbs and used two of the Wiborg White Badger bulbs, and prefer the feel of the latter. They were winners when it came to face-feel and density. But I've also never been crazy about Wiborg's handle shapes other than The Barber, and don't care for the busy flourish of lettering on the brush at all. Still, a White badger bulb with ebony Barber handle and block script would be welcome here. Looking forward to more reviews. I'm fortunate enough to own two Wiborg, one finest and one white badger. I've got simpsons manchurian/best, shavemac 2 bands, paladins, M&F, Varlet, Plisson, and noting compares to the white badger. That hair to me was just amazing, perfect blend of backbone and softness. I rarely venture from traditional faux ivory handles, but think the Wiborg Barber in ebony is a must. 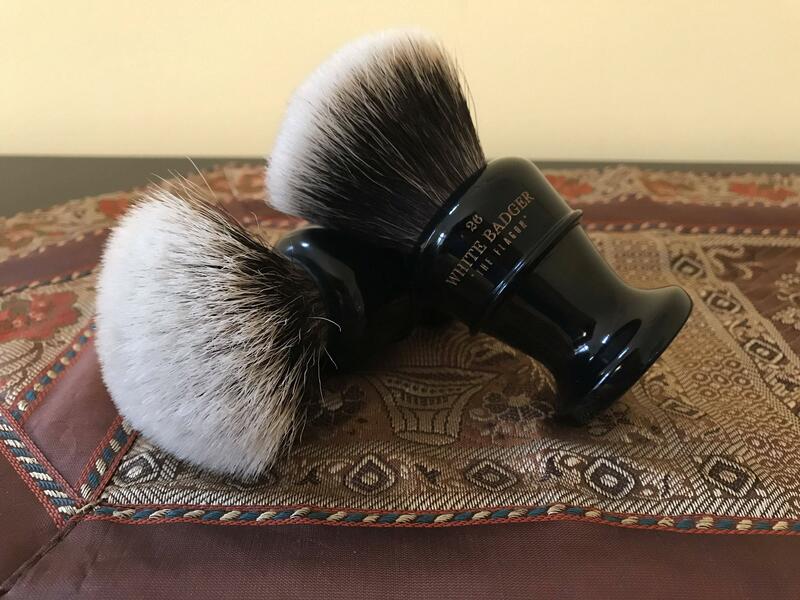 Although the intent of these comparisons was to put the Wiborg up against brushes that are easier to obtain, Ken and the Dark Holler crew are making such excellent brushes that each offering sells out within minutes. But, at least they are offered up on a regular basis at their website and occasionally secondhand on the forums. The construction of the Paladin brushes have been second to none, especially since they brought the knot installation in-house. They have teamed up with a very skilled knot manufacturer that is producing well formed, moderately dense knots. Their handle design and finish work are where Paladin truly stands above the crowd. This gives Paladin a huge advantage over Wiborg, in my opinion, as most Wiborg handle shapes seem to lack a refinement in design, most copying other manufacturer's designs, but in a less refined and typically more chunky fashion. 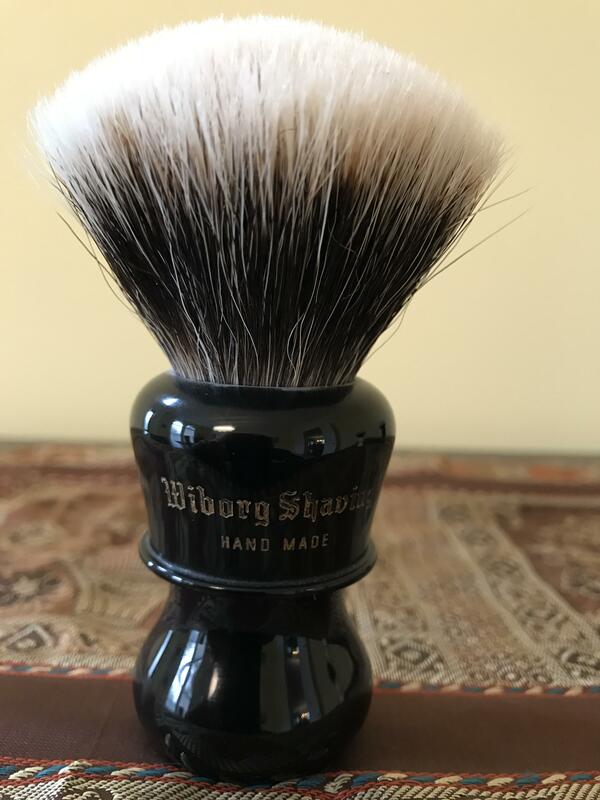 However, this particular Wiborg brush is ideal for my tastes in both size and shape and would probably be nearly the exact brush I would order if given the chance. As with the Shavemac before it this Paladin has slightly softer tips than the Wiborg, although without any synthetic feel (gel-like if you wish). I compared the Wiborg to a high-thread count cotton and the Paladin takes that same sensation and elevates it. I have to admit part of this is due to the more controlled splay on the Falstaff, making the brush feel more dense on my face. So if both brushes have equally soft tips but one has a more controlled splay, the latter brush will have a even more luxurious feel on the skin. As with the Shavemac before it, the Paladin feels like it has a similar density to the Wiborg. The Paladin has a slightly shorter loft and a small glue bump giving the Falstaff less "Free Loft" as Ken calls it. This combination gives the Paladin quite a bit more backbone than the Wiborg, I prefer the more natural feel of the Wiborg's splay but as I know with my other Paladin brushes this is easily attainable by choosing a brush with more free loft. 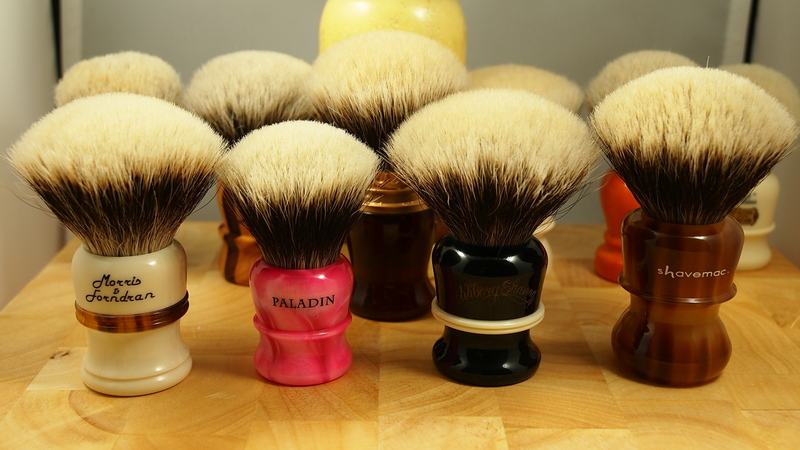 My current Paladin collection only consists of a couple of brushes, but if I had a brush available with a higher free loft the Paladin would walk away the unquestionable winner. As it is I'm going to call this one a wash as both brushes were so good I didn't want to stop face lathering. I currently only own one Paladin (Chief with a bulb knot) making it difficult to compare vs the Wiborg fans I own. I had a PK-47 that I sold. The latter had a different hair batch and was much less soft than the Wiborg or the Chief for that matter. The Chief I kept is very pleasant to use. However, it would not make it on my "most desirable brush list". As you say, at least for me, Paladin shines more through its excellent handle design and execution than through the knots. Arguably I should probably try another Paladin, and if I can get hold of a nice 28mm knot I might will. Hence, in my book and based on the brushes I tried, I prefer the white badger knot over a Paladin. A white badger knot in a Paladin handle would probably be the perfect combination. 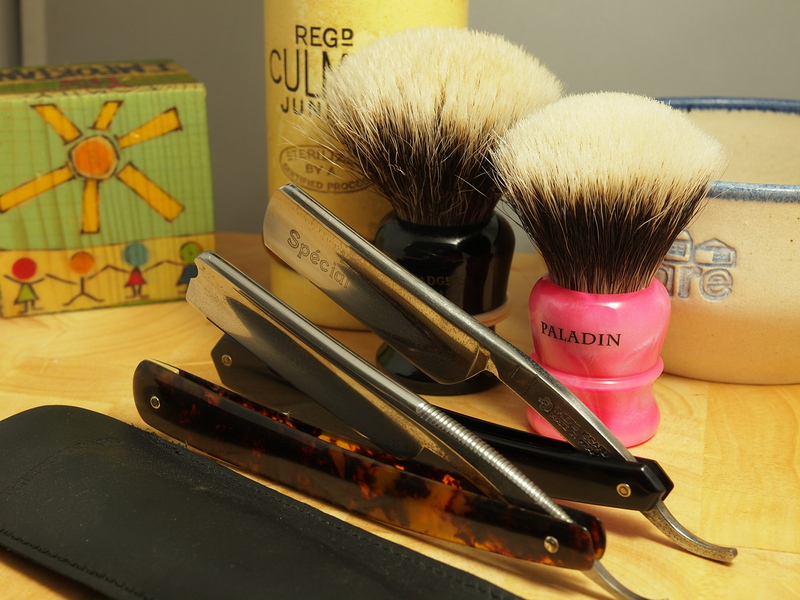 The Wiborg barber handle is one of the best Florian made, at least for my taste. Great comparison. I have a M&F CHS, a Paladin Falstaff 28mm, a 28mm Romera, and Stirling 26mm. But the one brush that I have that has the most "luxurious" feel is the Geo F Trumper CB3S. Go figure. Handle-wise, Paladins are the best. Period. Ken's knots have become more refined, more consistent, with each new release. We haven't seen the best of them yet. Wiborg White Badger, Elite Manchurian, and Thater 2-band make up my Final Four. Between them, they cover the spectrum of what I like. These reviews and the feedback have been great. This is March Madness I can really appreciate. Great thread! 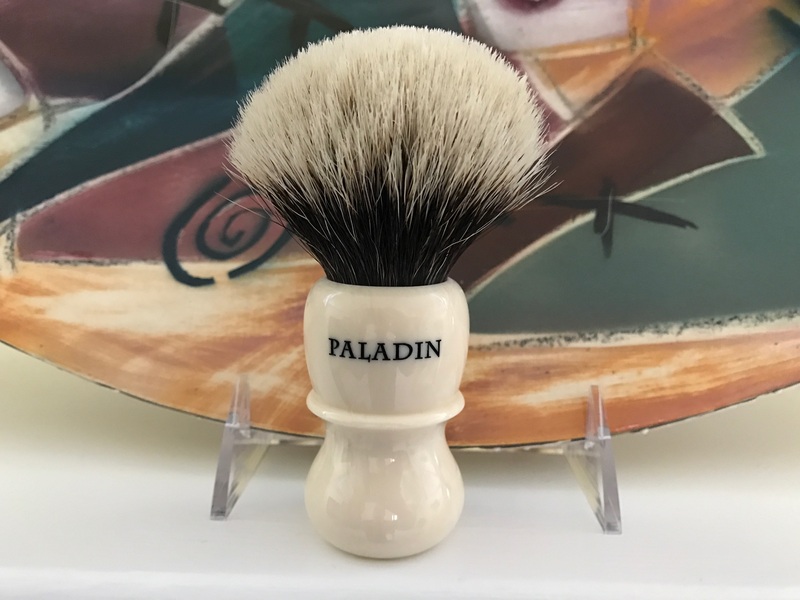 Just for completeness sake, what is the official designation of the knot in your Paladin brush?